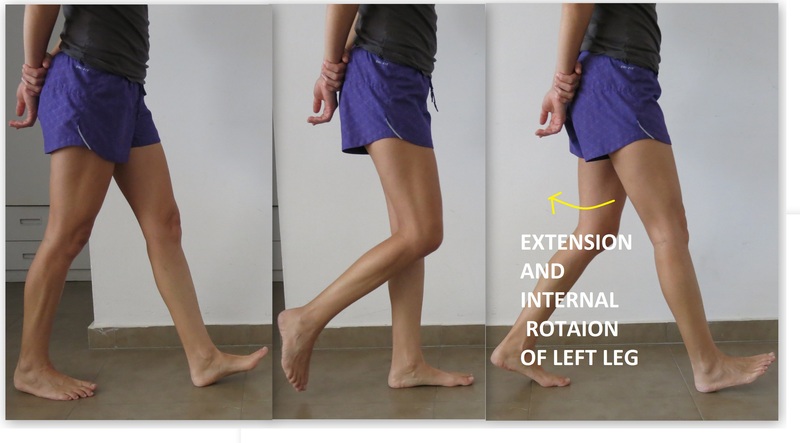 The ankle plays an important role in the pattern of lower limb movements both in weight-bearing and non-weight-bearing positions. Plantar flexion is the movement that describes the pointing of the toes toward the ground, as in standing on one’s toes. 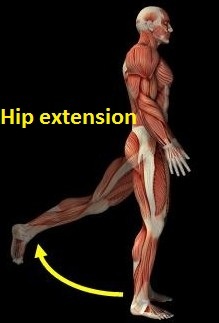 Dorsiflexion is the opposite of plantarflexion and involves pulling the toes up as in walking on one’s heels. 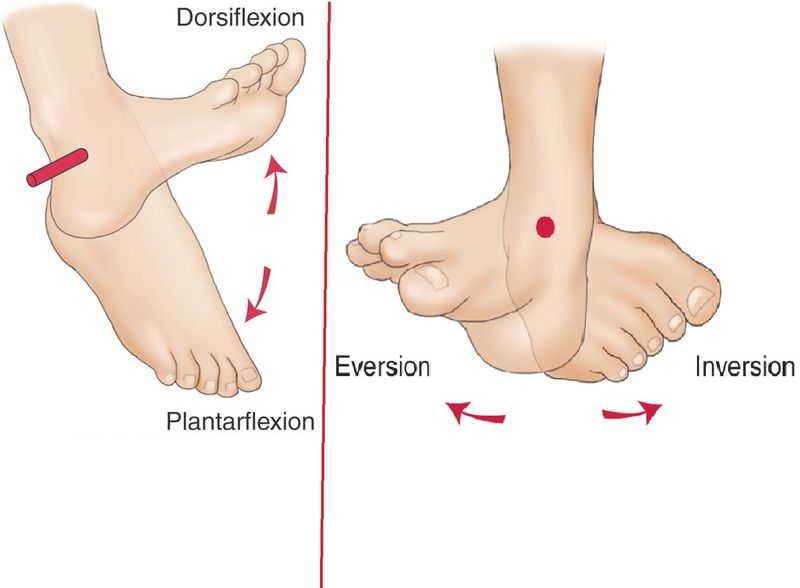 Inversion is inward rolling of the foot towards the body’s midline and eversion is the exact opposite which involves outward rolling of the foot away from the midline of the body. Talo-crural joint (Ankle joint): It a hinge type of joint that allows movements of dorsiflexion and plantar flexion along one plane.The articulation of the lower ends of the leg bones and one of the tarsal bones (talus) forms the ankle joint. 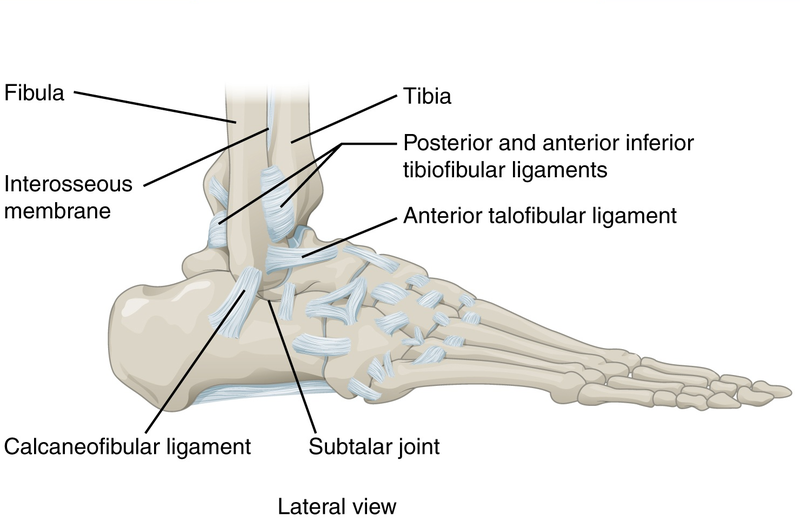 Subtalar joint: The movements of Inversion and eversion take place at this joint. It lies beneath the ankle joint and is formed by the articulation between the talus and the calcaneal bone of the foot. Distal tibiofibular joint (High ankle): This is a syndesmosis joint between the lower ends of the bones of the leg(tibia and fibula). A syndesmosis joint is a joint where the bones are connected by ligaments and have minimal movements. The muscles from the leg end as tendons that attach to the foot bones. 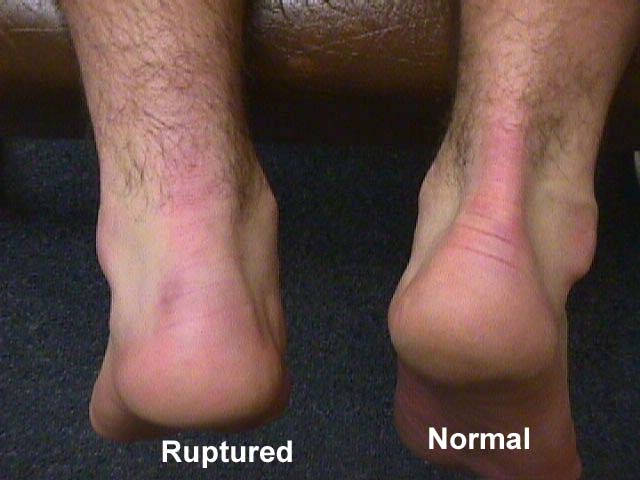 They contract and transfer forces to cause a movement across the ankle joint. 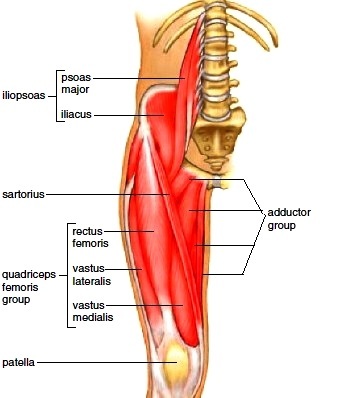 Outer muscles of the leg: The peroneal (Peroneus long and peroneus brevis) muscles are present on the outside aspect of the leg as shown in Fig 3. 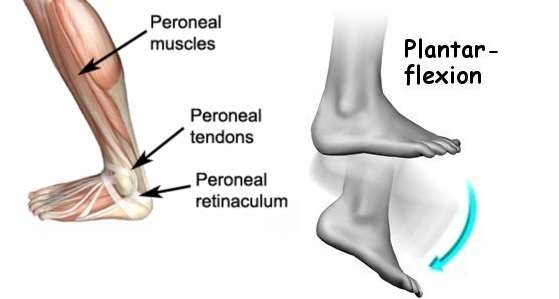 The contraction of the peroneal muscles help bend the ankle down moving the foot downwards (Plantar flexion) as in fig 3. The peroneals also help to stabilize the big toe as it attaches behind it. It helps to lift the arch and plantar fascia to produce spring-like effect during running and jumping activities. 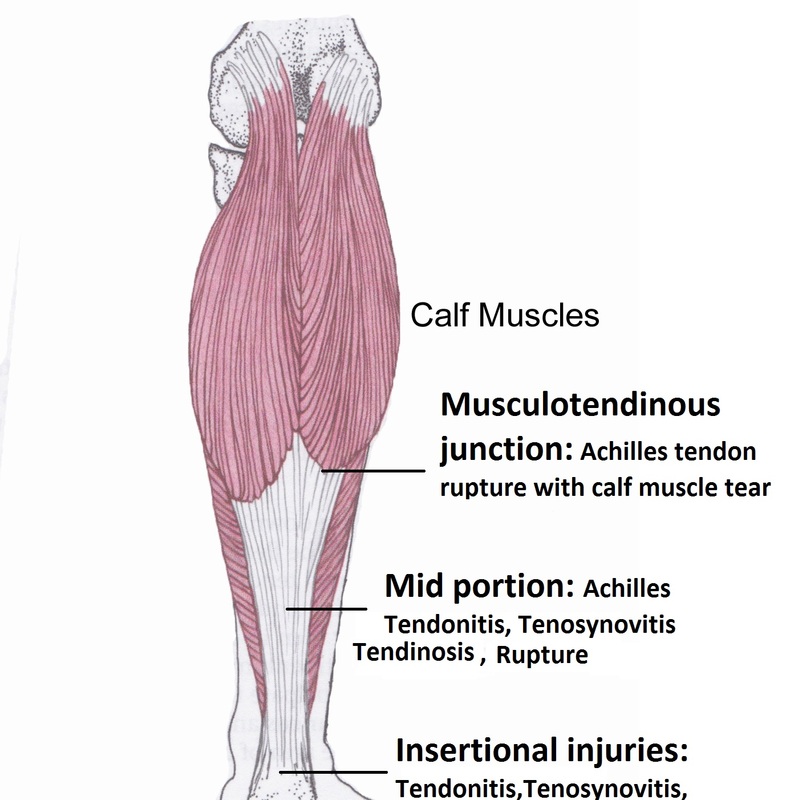 Back muscles of the leg: The calf muscles (gastrocnemius and soleus) and the tibialis posterior muscles are present at the back of the leg as shown in Fig 4. 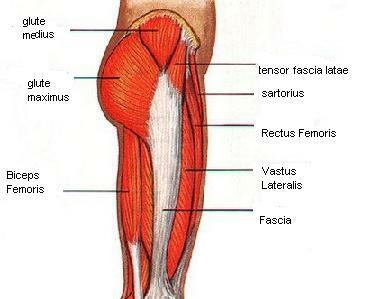 Fig 4: Calf and Tibialis posterior muscle. 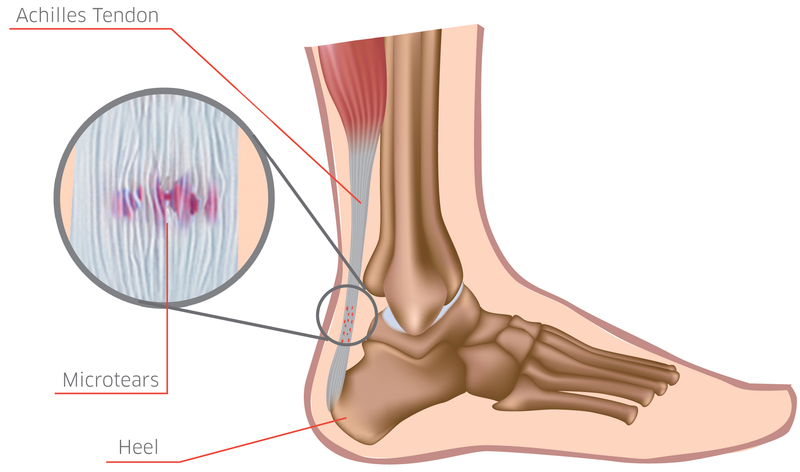 The calf connects to the heel bone by the Achilles’ tendon. 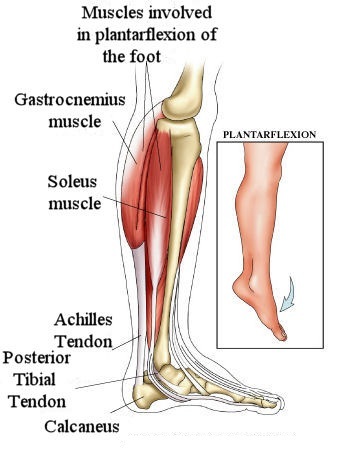 When the calf muscles contract they moving the foot downwards (Plantar Flexion). The posterior tibialis help to turn the foot inwards (Inversion). They help to propel the body forwards as the foot pushes on the ground while walking. 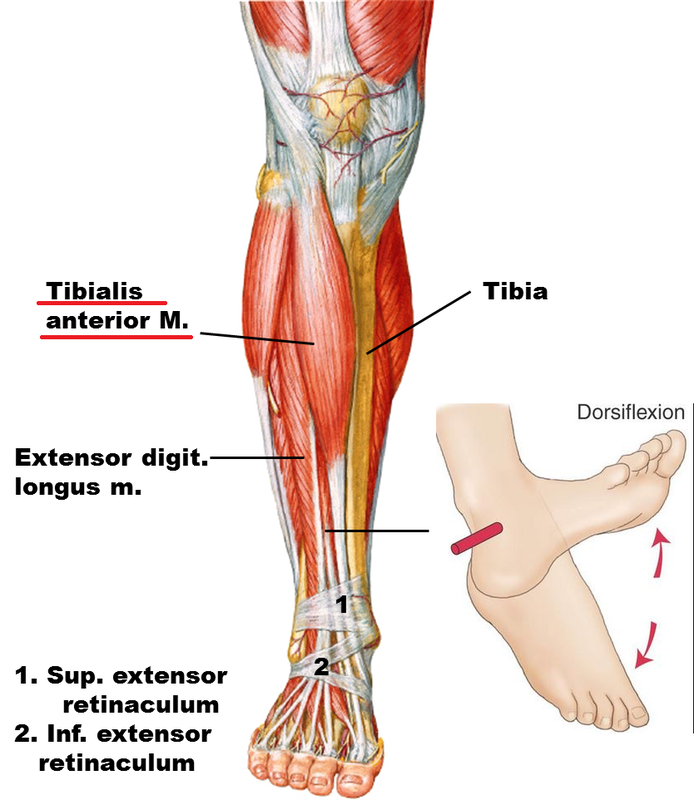 Front muscles of the leg: The tibialis anterior present in the front of the leg and attached in the front of the foot as shown in Fig 5. The Tibialis anterior muscle pulls the ankle upwards (Dorsiflexion). It plays a role in striking the heel when you take a step forwards in walking. Apart from muscles, the ankle is stabilized by many ligaments that surround the ankle. 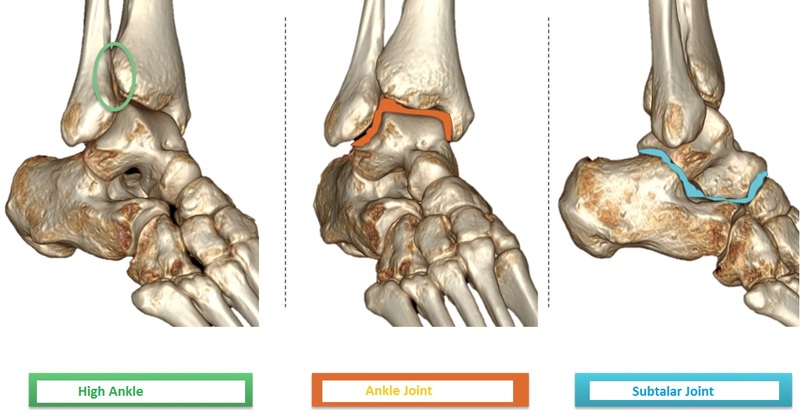 Lateral ligaments are present on the outer aspect of the ankle that are attached at the anterior (front), lateral (outer side) and posterior (back) parts of the ankle as shown in Fig 6. The Lateral ligaments play an important role to prevent excessive plantar flexion and inversion movements of the foot. Along with the medial ligaments, they also provide stability to the ankle during weight bearing movements. The medial ligament otherwise known as deltoid ligament is present on the inner aspect of the ankle, as shown in Fig 7. The medial ligaments function as the main stabilizer of the inner aspect of the ankle against shear and rotational forces. They also act to support the inner arch of the foot. 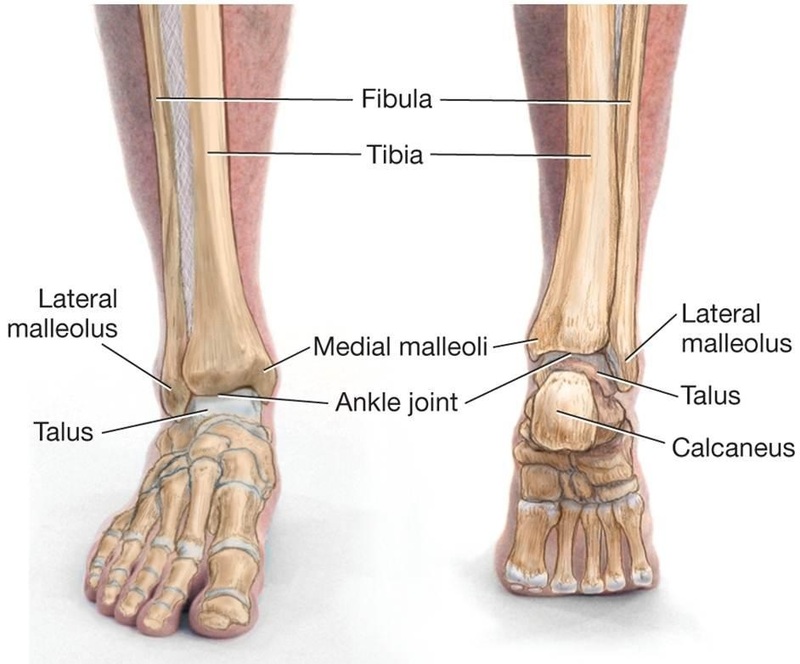 The distal tibiofibular ligaments are located above the ankle and connect the high ankle syndesmosis joint as shown in Fig. 8. 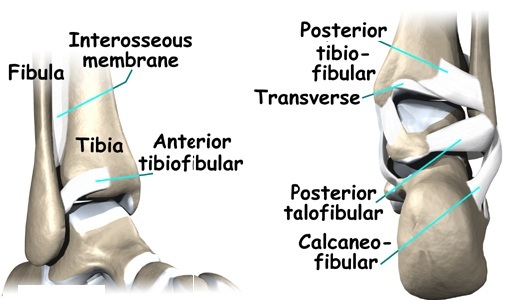 The high ankle ligaments ensure stability between the lower end of the tibia and the fibula. They resist any force that attempt to separate the tibia and fibula. 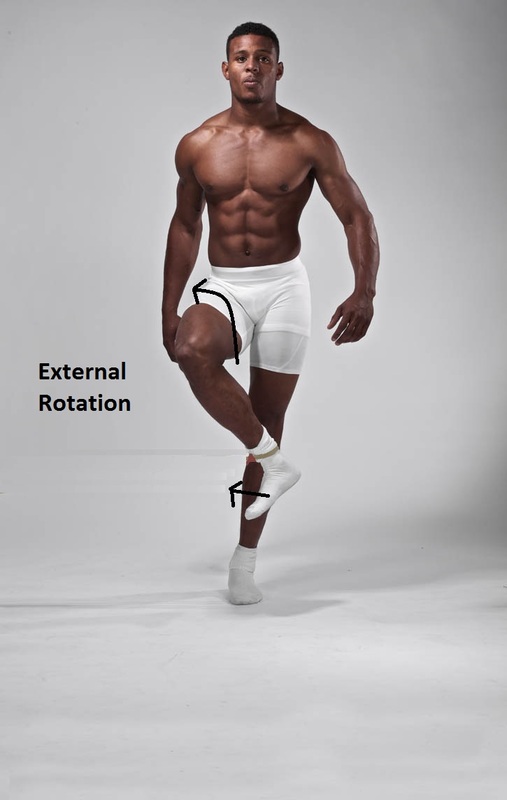 Any inflexibility in the ankle may cause inability to perform a movement properly. For example, poor ankle mobility due to tight soft tissue structures can reduce the range of movement at the ankle causing the knees, hips and trunk to over compensate. 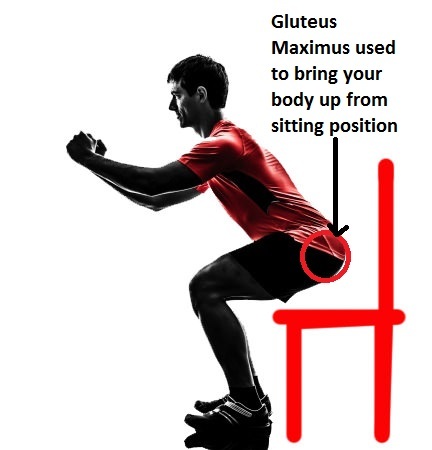 This may impair the ability of the trunk to load the joints properly hence increasing the risk an injury. Our shoulders are the most movable joints in our body. Most activities whether simple or strenuous engage both our shoulders. That is the reason why with a little bit of pain in our shoulders, we find it very difficult to do even the simplest of tasks like putting on a coat or carrying groceries. Sometimes there is a crunchy sensation or you may hear clicking and popping sounds while you move your shoulder or do weights. 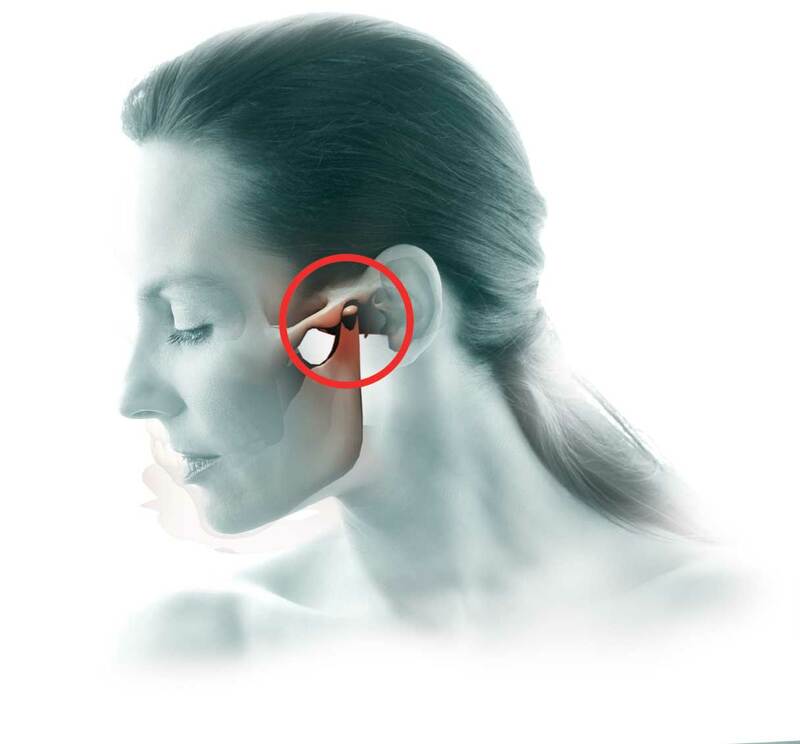 This pain can worsen making you feel frustrated, leaving your shoulders feeling weaker than normal and stiff to move. There could be many reasons for the cause of your shoulder pain but the most common injury that could possibly show these type of symptoms would be a rotator cuff injury. 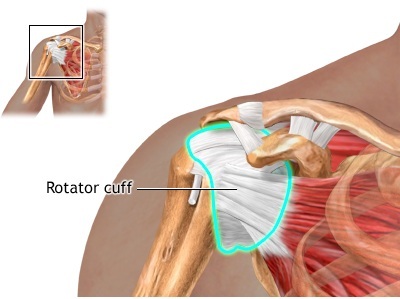 What is the rotator cuff and how does it get injured? The function of the rotator cuff, in addition to generating torque, is to dynamically stabilize the shoulder joint. It keeps the ball of the shoulder centred over the small glenoid socket. Thus, stronger rotator cuff muscles result in the better glenohumeral joint stabilization and hold the humeral head into the glenoid by depressing it. This prevents impingement and decreased chances of shoulder dislocation when the deltoid abducts(arm sideways up) the shoulder. Without an intact rotator cuff, particularly during the first 60 degrees the ball of the shoulder would migrate up the glenoid cavity causing the rotator cuff attachments to get compressed by the acromion leading to impingement of the rotator cuff. In patients with large rotator cuff tears, the humeral head is poorly depressed and can migrate cephalad during active elevation of the arm. 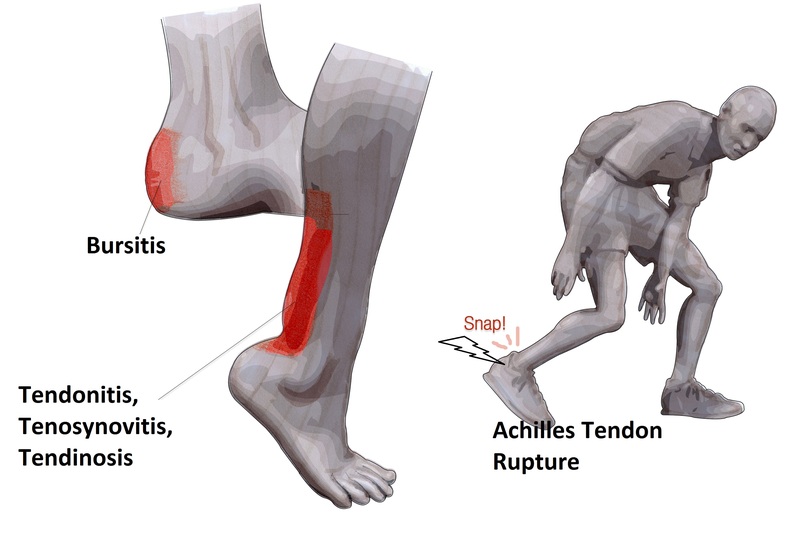 Sometimes sudden fall or high impact sports could be the cause of injury but in most cases, it is due to the repetitive injury over the tendons as they being pulled beyond their capacity to stretch. 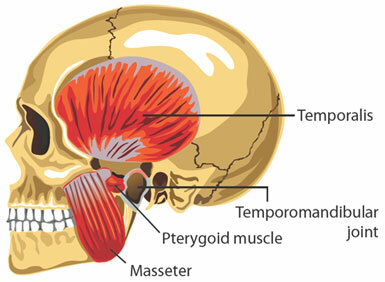 This gradually worsens causing partial or full tear of the tendons. Due to the way these tendons cup the shoulder by being closely spaced, they are more at risk of friction. Especially when you turn your shoulder or lift any weight at the end range of shoulder movement, the tendons in this tight space become taut and rub against the bony knob (acromion process of the scapula) above them or against a ligament at the front of the shoulder. This causes friction, pain and as a normal response, inflammation sets leading to pain, swelling and movement restriction. Tendonitis can occur in a particular rotator cuff tendon causing pain, inflammation and irritation. If this condition becomes more chronic, more tendons can become involved or it may progress to a tendinosis (degeneration). 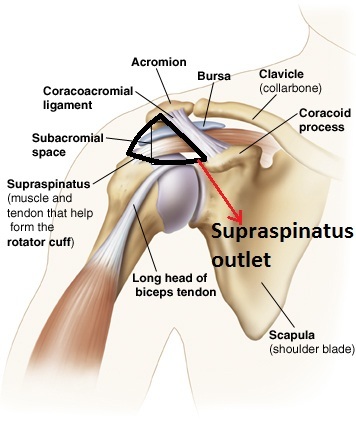 The most common site of impingements is within the “supraspinatus outlet”. This outlet is a space formed by the acromion process of the scapula, the coracoacromial ligament and the upper rim of the humeral head. 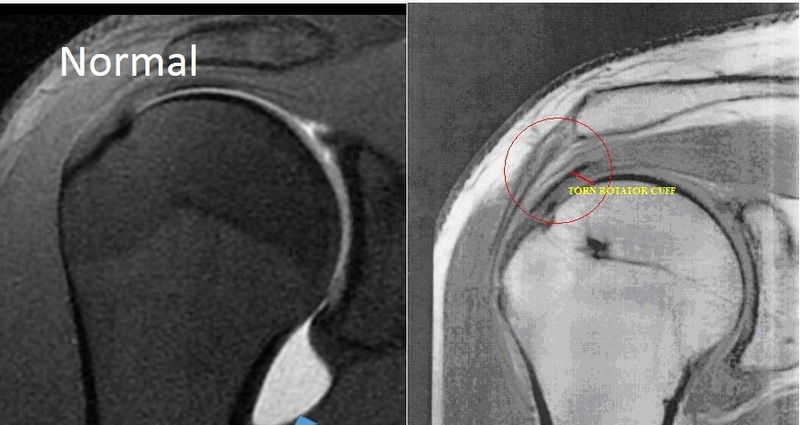 Thickened Coracoacromial ligament: This can cause impingement by becoming thickened due to excess calcium deposits that will compress the supraspinatus tendon. Hooked acromium: In repetitive overhead activities, the tendons rubs against the acromion process of the Scapula and gets damaged. When the inflammation spreads into the pocket of fluids (subacromial bursa) that lubricates the rotator cuff tendons under the acromion bone. 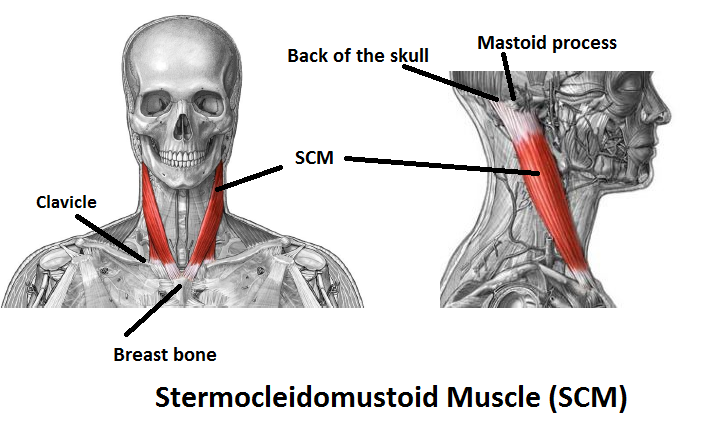 This causes subacromion bursistis and the pain gets even worse on movements. In the case of an unhealthy shoulder, the scapula does not move in the same fashion as the healthy shoulder and gets “stuck” in a lower position. This could lead to abnormal movement of the scapula during shoulder movement. 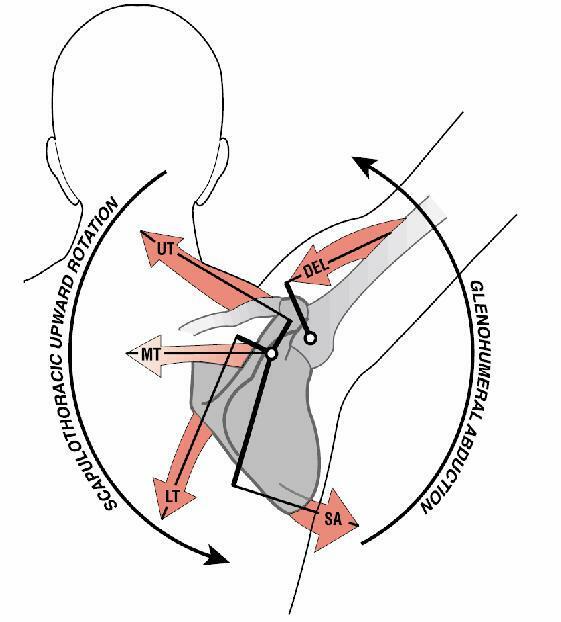 Poor scapular movement will cause compression of the tendons in the supraspinatus outlet increasing the chances of impingement of the rotator cuff tendon that goes under it. 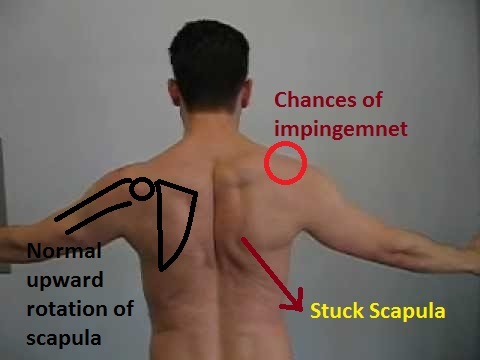 The picture below shows an unhealthy right shoulder at a risk of impingement, showing improper movement in the scapula. 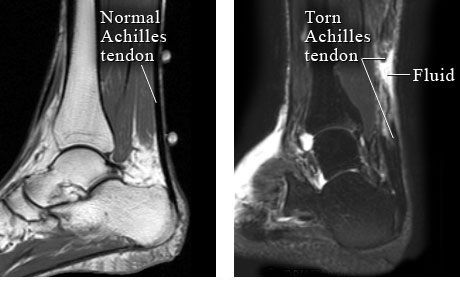 A tear is a result of the worsening of the tendon damage. 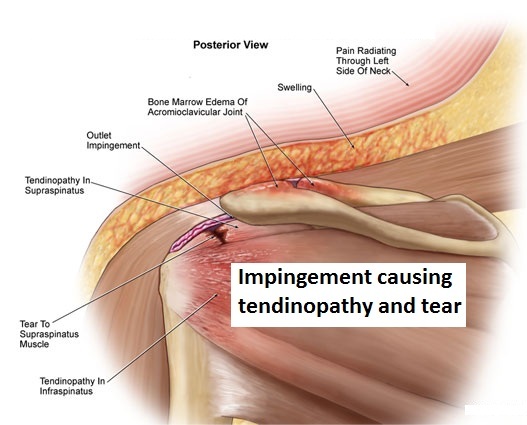 Although an acute fall can tear the rotator cuff tendon, chronic inflammation and degeneration due to impingement is the major cause of tears. This tear can start small and get larger over time due to repetitive use or a re-injury. When a tear occurs, there will be severe weakness and atrophy(loss of muscle mass) of the muscles around the arm and loss of movements of the shoulder. How is Rotator Cuff Injury Diagnosed? Pain in the shoulder could be caused by various other reasons like joint injury, capsule injury, nerve problems and many more. A thorough examination of the shoulder should be done to distinguish the injury type. If a tear is suspected in the rotator cuff an MRI or an arthrogram (X-ray of the shoulder joint after injecting a contrast dye) can be taken. A proper diagnosis and plan of management is necessary for the treatment and prevention of rotator cuff damage. Initial treatment would be pain relief, rest and avoiding any activity that aggravates pain in order to enhance the healing process. Further treatments will be decided upon the individual’s condition. Thorough assessment and planning by the experts with an application of knowledge of the condition and correct methods of treatment will promote recovery and prevent injury reoccurrence. The main joint of our upper limb is the shoulder joint which can be moved in various positions when looked at in a three-dimensional perspective. 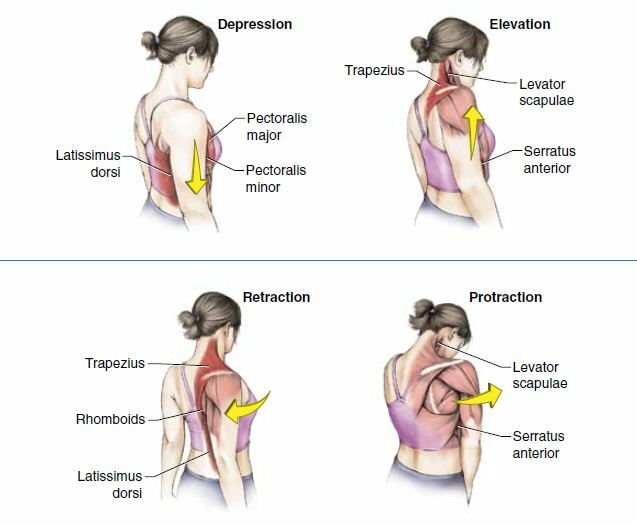 In order to be able to have these movements, many other components help in order to maintain a stable shoulder. In short, there is a complex interplay between the shoulder joint, other joints, muscles and ligaments that make the shoulder a complex and unique part of our body. 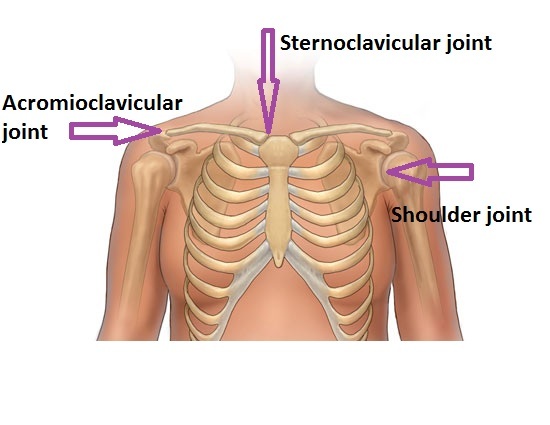 The Clavicular joint with the breastbone sternum (Sternoclavicular joint – SC). The shoulder joint (GH) is made of two main bones that articulate with each other forming the ball and socket joint. The ball of the arm bone(humerus) and the glenoid cavity of the shoulder blade(scapula) is articulated at the shoulder joint (GH joint). Similarly, on the inner chest, the clavicle articulates with sternum to form the SC joint while on the outer end towards the shoulder the clavicle articulates with the acromion process of the scapula bone to form the AC joint. Both GH, SC and AC are true joints with union by fibrous, cartilaginous or synovial tissues. 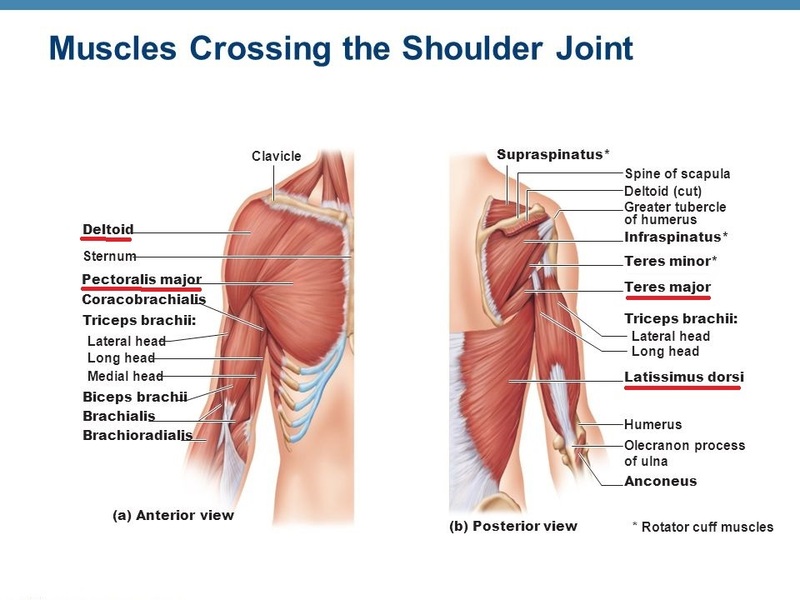 Lastly the ST joint, while this is not a true bony joint, its muscular attachments create a shoulder joint complex. 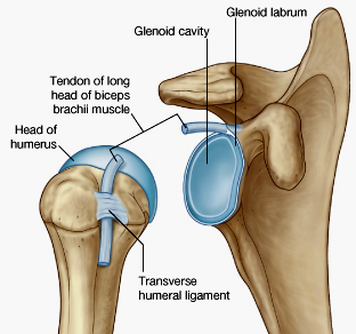 The humeral head (ball) is about three times larger than the glenoid fossa. 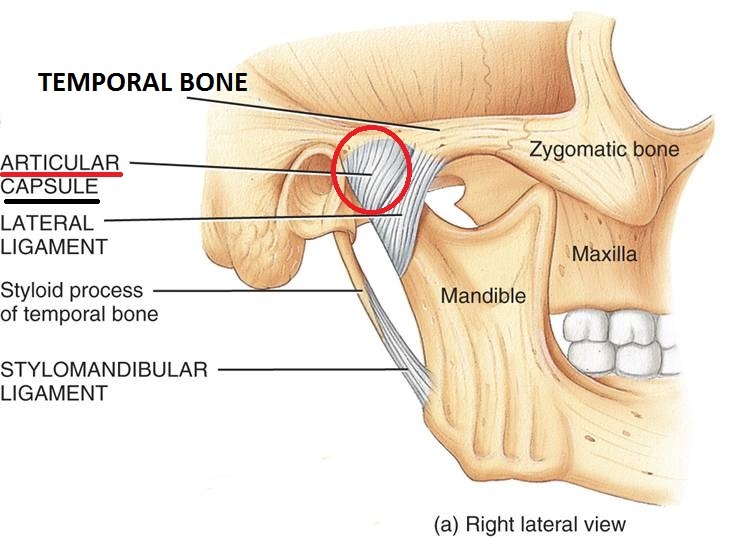 Actually, only 25 percent of the humeral head articulates with the glenoid fossa. Glenoid cavity (fossa) forms a very shallow socket as compared to the hip socket of the hip joint. Therefore, the humeral head articulates with a smaller open and shallow saucer- type of articulation, lacking stability in its own. However, it is with all the soft tissue structures both inside and outside the joint that are responsible for the overall stability of the arm during movements. A smooth, white tissue that covers the humeral head (ball) and the glenoid fossa to make it easier for the two bones to move at the joint. It allows the bones to glide over each other with very little friction. Since the head(ball) of the upper arm bone is larger than the glenoid fossa, the articular cartilage forms a soft fibrous tissue rim called the labrum which surrounds the socket to help fit the head into it thus stabilizing the joint. The socket can be divided into four regions namely anterior (front), posterior ( back), superior (the upper end near your head), and inferior (the lower end which is towards the elbow). Based on these regions the labrum is also called as superior, inferior, anterior and posterior labrum. 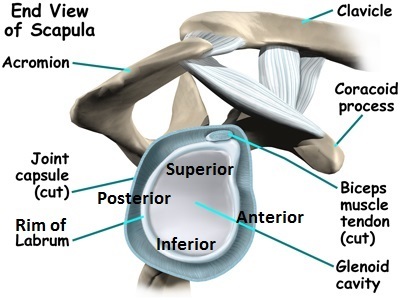 The shoulder joint capsule is a membranous sac that encloses the entire joint. 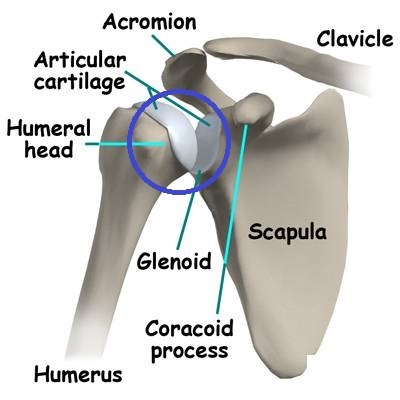 The joint capsule of the shoulder is attached along the outside rim of the glenoid labrum of the glenoid cavity and attaches to the neck of the arm bone. 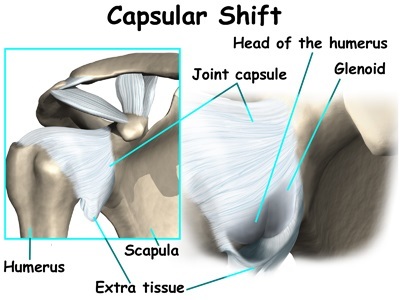 The capsule by itself is quite loose and it is the surrounding reinforcement by the muscles, tendons, and ligaments that are largely responsible for keeping the shoulder joint stable. In the shoulder, there is a group of ligaments that is responsible for the stability of the shoulder. This ligament attaches from along the outer glenoid socket covering the joint to the upper part of the arm bone. 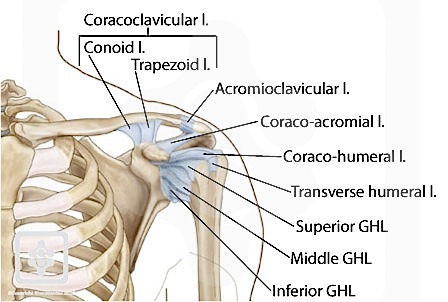 This ligament attaches from the coracoid process to the acromion process of the shoulder blade (Scapula). These two ligaments (trapezoid and conoid ligaments) attaches from the clavicle to the coracoid process of the scapula. This ligament can carry the load and is extremely strong. These tiny ligaments (with the AC joint) keep the stability between the scapula and the clavicle and thus keeping your shoulder ‘square’. This ligament protects the long head of biceps tendon muscle in the groove of the arm bone. Muscles of the shoulder connect the shoulder girdle, the clavicle and arm bone. Muscles that origin from the clavicle or scapula and/or body wall(ribs) to the top end of the humerus. Originate from the base of the skull and/or spine and connect the scapula and clavicle to the trunk of the body. Trapezius forms cross-shaped web along the neck and run from the spinal column out to the shoulder blade and clavicle bone. It helps to shrug the shoulders. 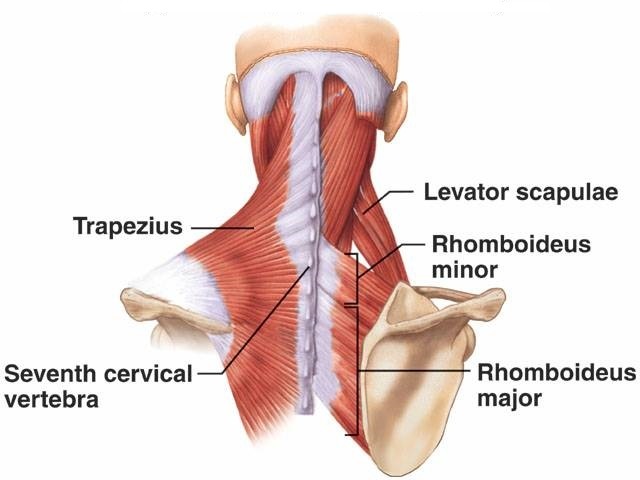 Rhomboids and levator scapulae are important muscles that join the shoulder blade to the spinal column helping the scapular movements. Serratus anterior muscle helps to stabilize the shoulder blade on the chest wall. When this muscle is weak, winging of the scapula occurs which is when the shoulder blade protrudes from the back. These arise from the clavicle and/or scapula and/or body wall and connect to the upper end of the arm (humerus) and anchor the shoulder joint to our body. Deltoid muscle is a muscle that is responsible for overhead activities. It helps to move the arm sideways up. Pectoralis major muscle like the deltoid is another powerful muscle which is the main muscle when doing push-ups. 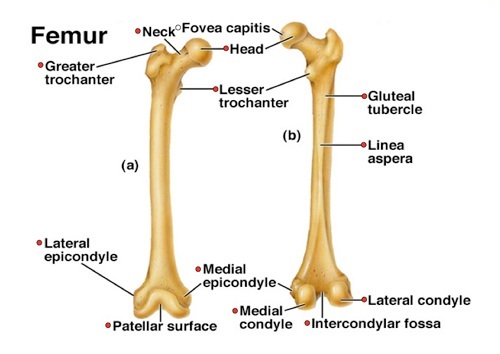 It originates from the front of the chest and collar bone and inserts on the upper part of the arm bone (humerus). 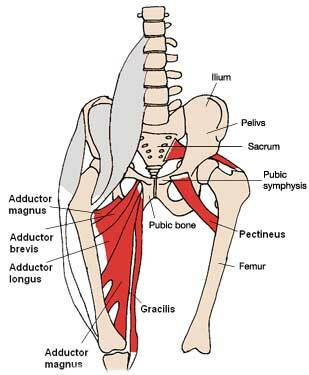 Latissimus dorsi is another powerful muscle that together with the teres major muscle pulls the arm down to the side. We use this muscle when doing chin-ups. What are the Shoulder blade movements? The muscles of the shoulder complex work together to perform a particular action. The Scapula and arm bone move together in a pattern to perform a movement. These muscles connect the shoulder blade (Scapula) to the arm bone (Humerus) supporting the entire shoulder joint during movements. The major function of the four rotator cuff muscles is to work simultaneously with each other to allow the arm to move freely in numerous positions. 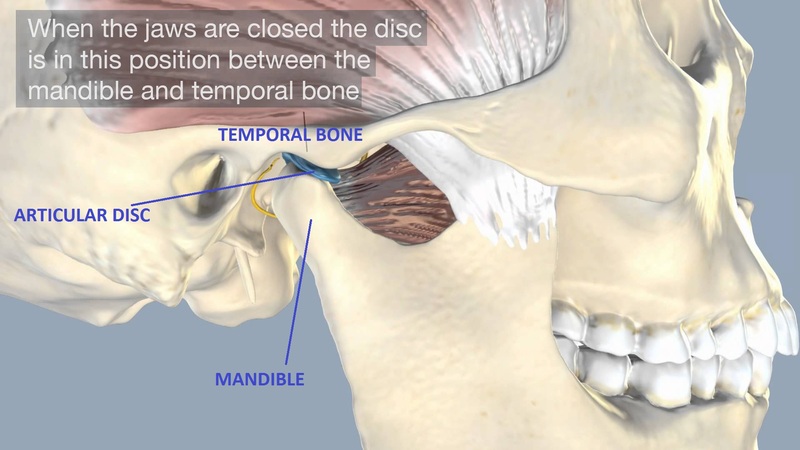 They do all this while pulling the humeral head downward and inward within the glenoid fossa. Supraspinatus assists with lifting the arm with the deltoid above the head (abduction). 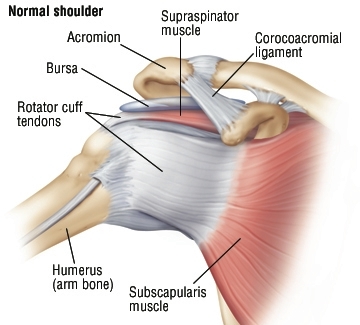 This is the most common muscle / tendon to tear in the shoulder. Subscapularis twists the arm behind (Internal rotation) the back. Infraspinatus and the teres minor twists the arm outwards(External rotation) and sideways from the body. Subscapularis assists with Deltoid, Biceps, coracobrachialis, Tere major to bring about shoulder forward flexion movement. Triceps, latissimus dorsi, pectoralis major, teres major brings the arm backwards (Extension). Why is the Rotator cuff is so important? In order to prevent upward dislocation of the arm or tear within the inner soft tissue structures like labrum and capsule of the shoulder, balanced rotator cuff strength and function are necessary. All the rotator cuff muscles work together stabilizing the humeral head within the glenoid while the larger muscles like the ltissimus dorsi, pectoralis major and deltoid produce the forces necessary for movements. 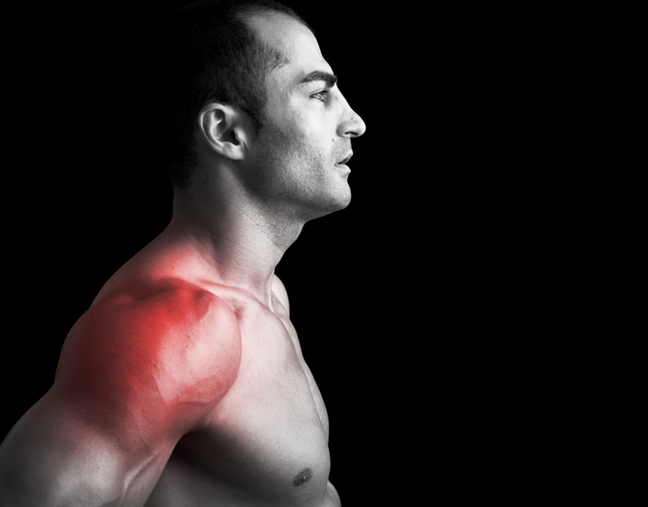 Most injuries to the shoulder are due to sudden trauma or repetitive trauma to the soft tissues and bones. 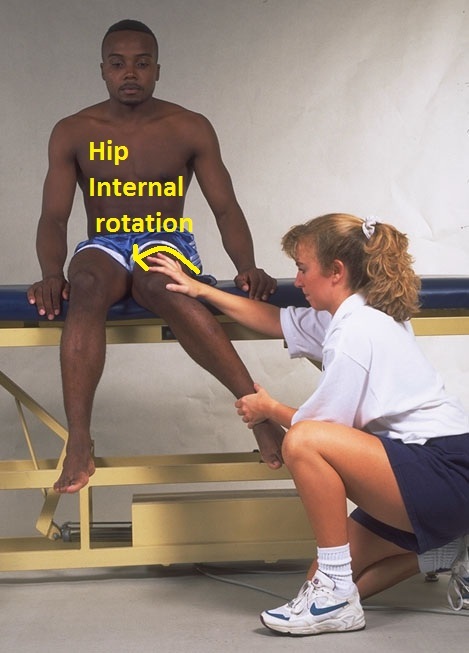 Some of the injuries occur because of improper exercise selection, faulty technique, lack of warm-up, lack of dynamic stretches, dehydration and many more. However, knowing the anatomy and functions of the joints and soft tissue structures of the shoulder complex not only gives you a better understanding of it but will possibly give you a prospective as to how important is their role in maintaing the stability of the shoulder. The only time feeling weak at the knees would be a normal phenomenon is when you are standing at the edge of a cliff or doing a bungee jump. 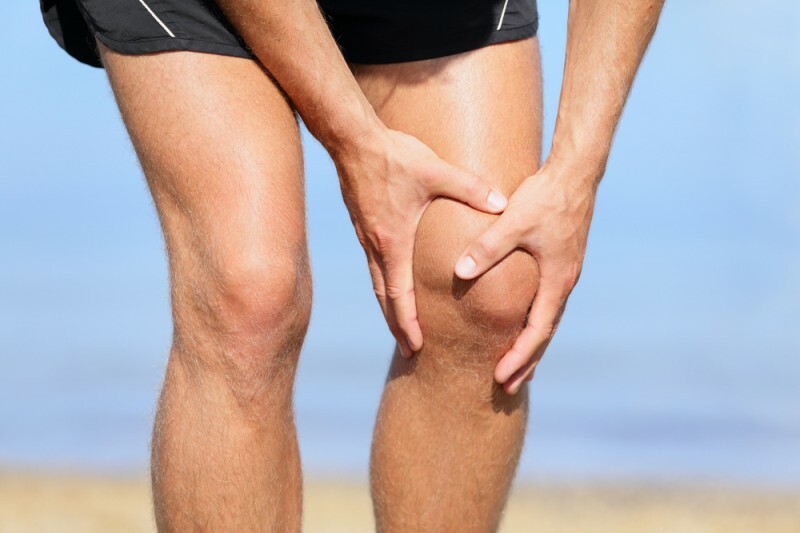 Experiencing weak knees with joint pain can be quite debilitating. We can sit, stand, walk, run and move about easily because of our knees. What we should know is that our kneecap is a part of the knee joint and it should remain ‘in the groove’ for optimal function. The kneecap, also called the patella bone, is a sesamoid bone in the front of your knee. It’s called the sesamoid bone as it has the shape of a sesame seed. The sesamoid bone is a bone that grows within a tendon. The patella has many biomechanical functions which are responsible for the protection, support and movements at your knees. The knee joint (Patellofemoral joint) is comprised of the three bones. The thigh bone (Femur), the shin Bone (Tibia) and the patella (Kneecap). The patella lies in a groove at the lower end of the femur and acts as an attachment point for the four main muscles of the thigh (quadriceps). 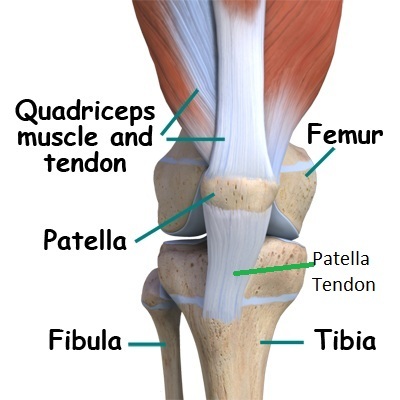 The lowest part of the patella continues on as a tendon that attaches to the tibia. The muscles pull on the patella and the patella pulls on the tibia allowing you to straighten your knee from a bent position. 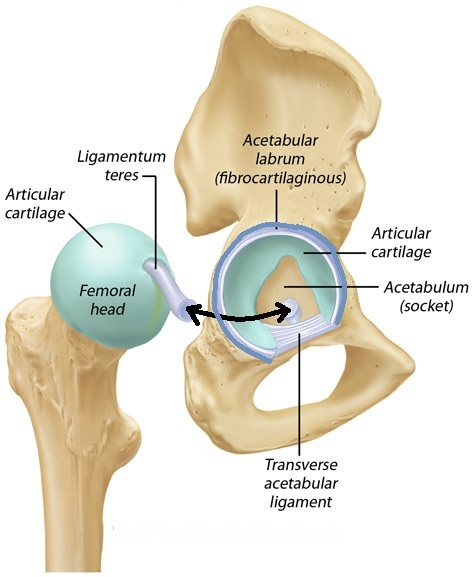 The cartilage is a taut protective structure underneath the kneecap. 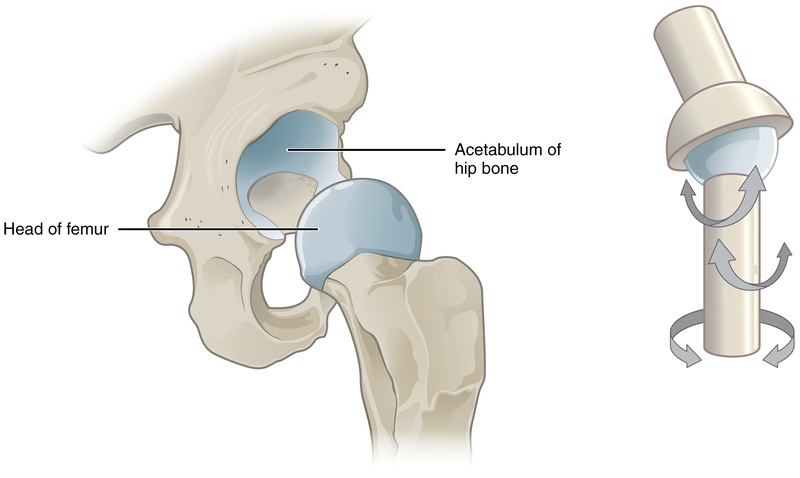 It found to be among the thickest cartilage in the body providing cushioning for the patella bone. The cartilage helps to prevent friction and acts as a shock absorber protecting the bony surfaces. 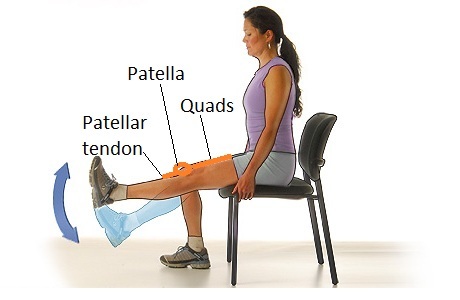 Why is the patella so important? The kneecap plays an important role, it increases the leverage of the quadriceps tendon (thigh muscle tendon) and protects the front of the knee from direct trauma. 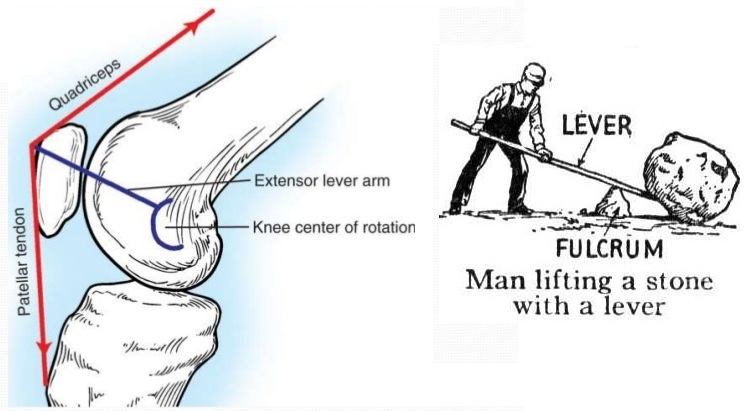 The quadriceps muscle is providing the force like the man in the picture, the patella bone acts as a fulcrum to provide more leverage for lifting the stone. In real life though, the patella is a little more complicated by not only providing increased force, but also by aiding in balancing forces as well as providing a direction for the forces. As weight bearing stress falls on our knees, the patella acts as a spacer protecting the quadriceps tendon and bone from coming into compression and creating a frictional force. The patella also allows for smoother movements when bending and straightening the leg. 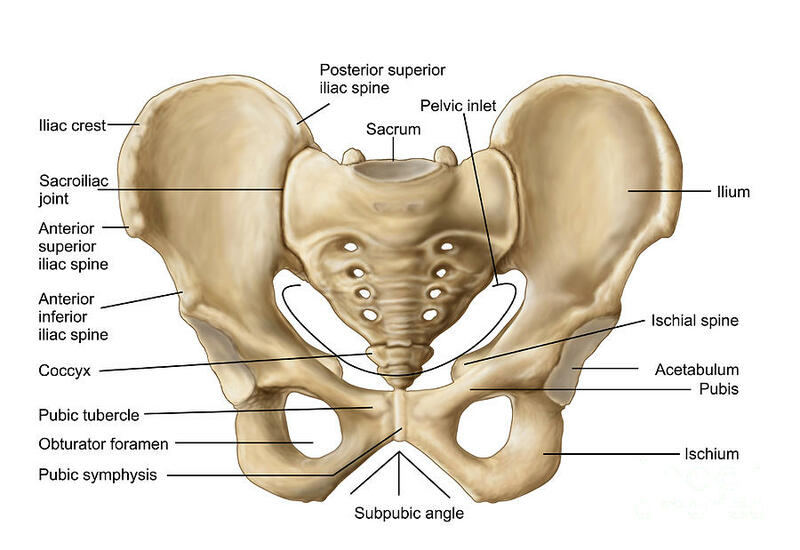 The quadriceps angle or the Q angle is determined by drawing one line from the hip bone (anterior superior iliac spine) through the center of the patella and a second line from the center of the patella through the leg bone (tibial tuberosity). 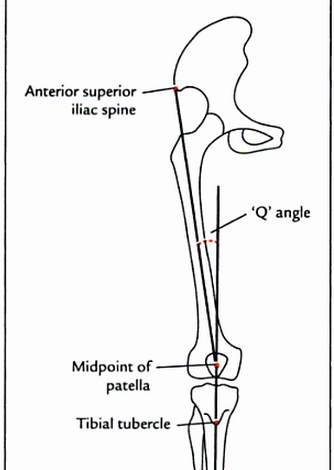 As the Q angle increases above 15 degrees, it potentially could cause the patella bone to move out of its groove. 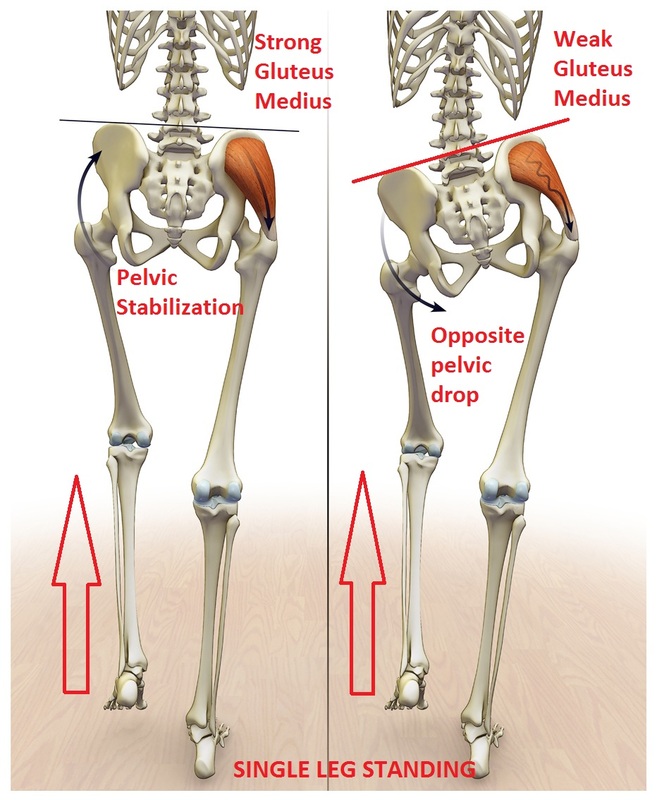 This is as if the Q angle is increased, forceful contraction of the quadriceps muscle can cause the patella to move outwards and possibly dislocate. Slight changes in the Q angle would cause imbalances in the muscle forces causing compression stress, symptoms of pain and inflammation at the knee joint. 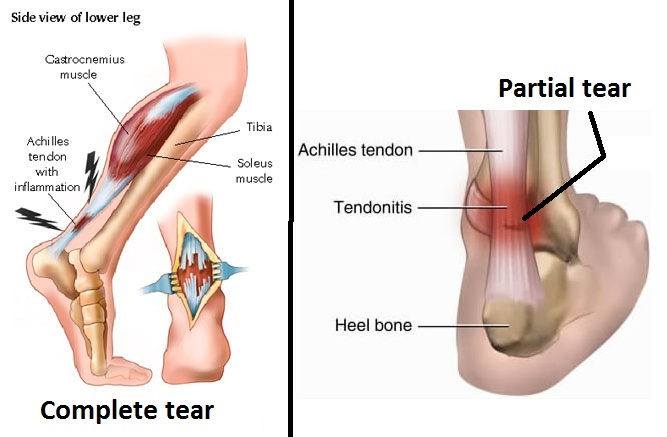 Although patellar dislocation, fracture, and patellar tendon inflammation are the common sports-related injury. Many patella related problems may also occur during daily activities. 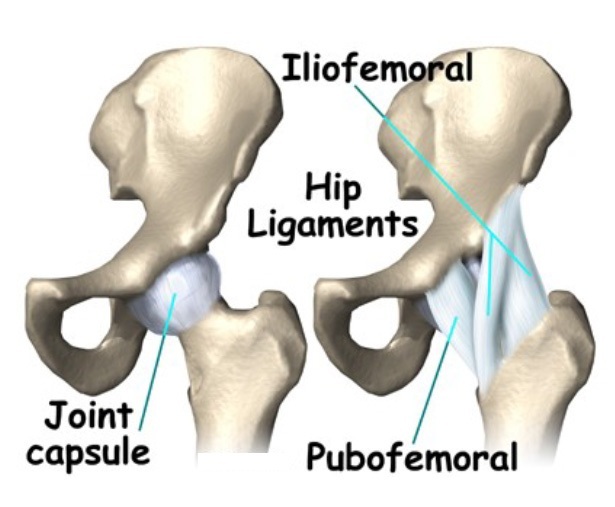 Patellofemoral joint pain is a condition seen in runners causing pain during running or while at rest. 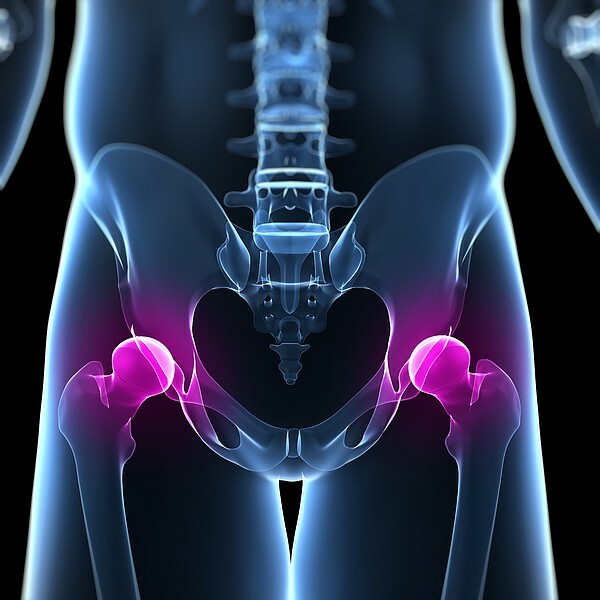 Pain usually occurs in the front of the knee. This often affects young, otherwise healthy athletes. Chondromalacia patella is one of the conditions that cause pain in front of the knee. When pain exists in the absence of cartilage softening, it can be referred to as patellofemoral pain syndrome (Runner’s knee). Although it’s common to sporting individuals, it can also affect individuals with weak quadriceps muscles. It is common among individuals engaging in activities like football, cycling, tennis, weightlifting, runners. In other words, any sport that involves running, jumping, squatting and landing on the knees. Prepatellar bursitis has historically been referred to as “housemaid’s knee”, which is derived from a condition that was commonly associated with individuals whose work necessitated kneeling for extended periods of time. Prepatellar bursitis is common in professions such as carpet layers, gardeners, roofers, and plumbers. This is common among individuals who engage in activities that involve kneeling down for long hours causing inflammation of the bursa below the patellar tendon. It can also occur conjunctively with a condition called jumper’s knee. Injuries such as direct trauma and overuse injury to the bursa beneath the quadriceps tendon cause inflammation of this bursa.Overuse injuries caused due to running on uneven surfaces or doing jobs that require crawling on the knees. 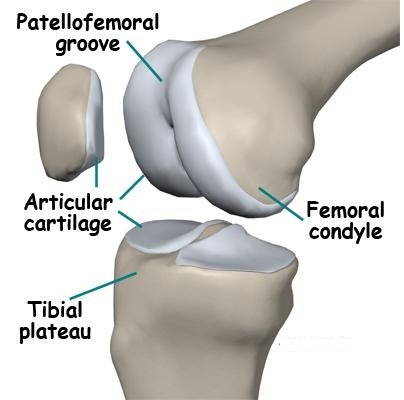 Patellofemoral arthritis occurs when the articular cartilage on the underside of the patella wears down causing friction between the patella and the end of the thigh bones. It gets extremely painful during weight bearing with swelling, inflammation around the knee. 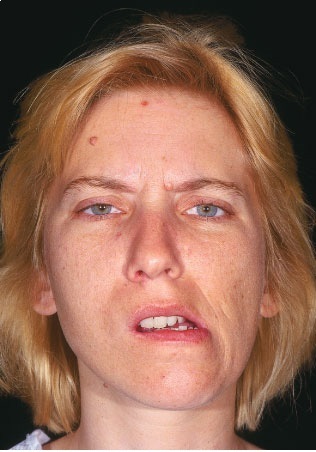 It is generally a degeneration condition which requires immediate medical attention to manage the condition. This type of injury happens when the kneecap (patella) moves out of its groove due to the sudden change in direction engaging in high impact sports. 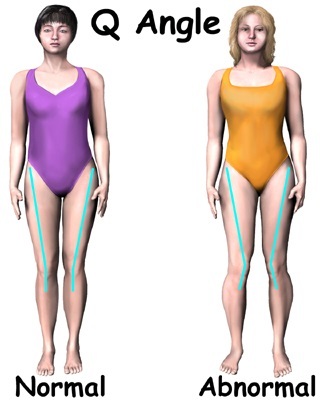 It most commonly occurs among young girls or hypermobile individuals due to laxity and increased hip angle. Direct trauma to the kneecap could also cause dislocations. As a precautionary measure, using knee pads during sports and regular exercises of your knee muscles will have great benefits for your patella. Generally, most of the injury conditions can be managed with appropriate treatment and rehabilitation. However, if you’ve only begun to feel pain while doing activities or just by standing, you might like to seek medical attention to prevent long-term pain or further damage to your patella.